Tipalti provides a powerful mass payments management solution, automating the entire process of making payments to global suppliers and partners. 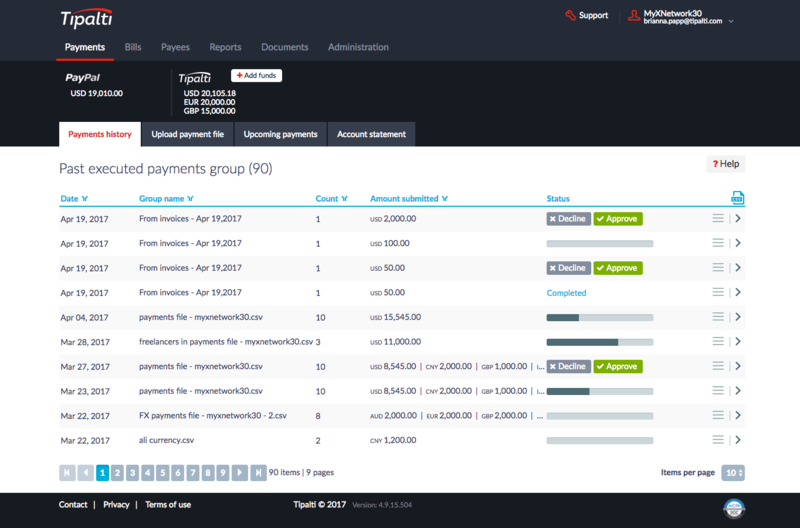 Tipalti provides one cloud system that includes white-labeled supplier onboarding, W9 / W8 tax form collection and validation, payment method and currency selection, global remittance, early payments, payee payment status communications, payment reconciliation, 1099 / 1042-S tax filing preparation reports, and ERP integration. Tipalti allows users to scale payables operations while employing best practices for reducing risk and improving tax and regulatory compliance. Tipalti can help launch new and unique business models made possible by efficient payables as an enabler of revenue. Tipalti brings global payees unprecedented value: streamlined invoice and payment processing, payment method choice, automatic currency conversion, and easy early payments. Tipalti has enabled users to transform their payment operations from cost-centers to cost-neutral centers of excellence. Still not sure Tipalti is right for you? Use our Product Selection Tool to compare other Accounting software solutions. Have questions? Call one of our unbiased Technology Advisors for a free consultation. Learn everything you need to know about Tipalti. Our experts will reach out to you shortly.